auxmoney has been revolutionising the credit market since 2007. 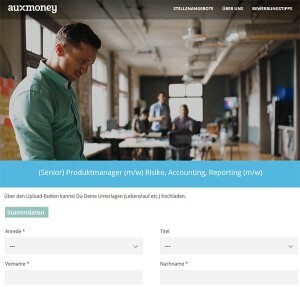 More than 140 employees ensure that personal loans can be easily financed by private and institutional investors via the largest credit marketplace in continental Europe. Borrowers range from the self-employed and start-ups to people who want to finance a move, studies or training. In the search for a complete software solution for recruiting and HR, the company opted for the rexx Suite. In addition to its good reputation on the market, the decisive factor for the decision was the scalability of the software, mainly due to the high growth. For the HR department, special focus has been placed on digital personnel files to allow managers to view and edit all the information of their employees at a glance. The aim was to streamline HR processes and thus save time. In conjunction with the Compensations & Benefits module, different types of remuneration can be created directly from the file, transferred to common payroll accounting systems via an interface, and finally evaluated using the clearly structured search & list engine. Employees can conveniently view the associated pay slips using the rexx self-service portal. Enabling them to independently book holidays via the user-friendly portal with additional insight into all hours worked creates transparency and further simplifies the absence management process. Digital workflows allow employees to autonomously modify master data, such as address or bank details. The process remains paperless and error-resistant, because each employee knows his/her own data best. The only thing left to do for the HR department is to click to confirm. The modern auxmoney job portal – naturally, in a responsive design – meets the demands of today’s mobile society. In recruiting, the rexx systems candidate management program impresses with efficient digital processes, which, among other things, make communication with applicants fast and convenient. Applications are uploaded online via the individually designed job portal and made available for processing in rexx Recruiting. Young people, in particular, almost exclusively send online applications. It is therefore especially important to reach the target group through social media channels, etc. Through interfaces with all common job boards and social media platforms, rexx E-Recruiting enables the convenient publication of job offers, including mobile application options. Once the candidates have arrived in the applicant management system, expert decision-makers can give feedback on the candidates and invite them directly to a job interview. Successful applicants are imported directly into rexx HR via an interface. This simplifies and streamlines the recruiting process and makes it clear. Want to find out more about applicant management with rexx Recruitment software? If you would like to visit us at one of the HR trade fairs, we would be happy to send you free tickets. Or make a personal appointment to get to know us!